I’ve had this sorry little chair in my stash for a while now. It called to me from the curb one morning while taking the kids to school. You can imagine the moaning and groaning of my children as I stopped to pick it up. “No Mom! Pleeeeeeeeze don’t stop!” Unfortunately for them I couldn’t risk the garbage man taking it away before I could get back to it so I had to stop. I do have a picture of it somewhere of what it looked like before but surprise, surprise I cannot remember what I filed it under. It was literally muddy with dry mud and very rickety. Someone must have tried their painting skills on it and then lost heart as it was partially painted with a bit of white paint. After a cleaning and sanding followed by a light coat of Lucketts Green MMS Milk paint and a bit of distressing, this is what she looks like now. 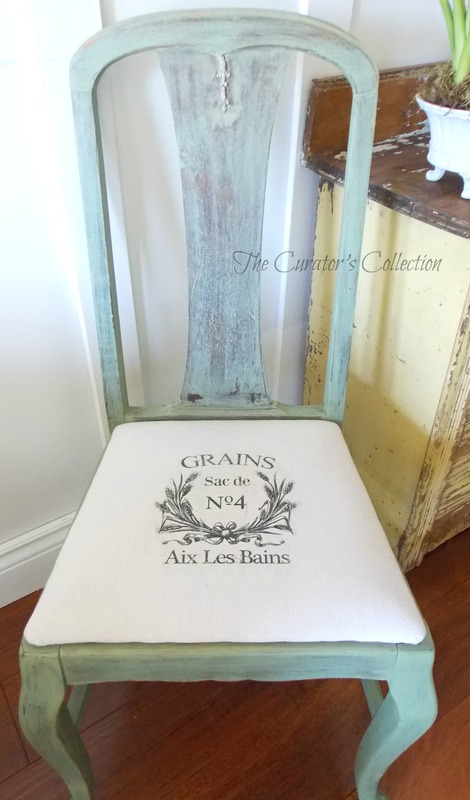 I also upholstered the seat and added a grain sack image transfer to give it a little more character. 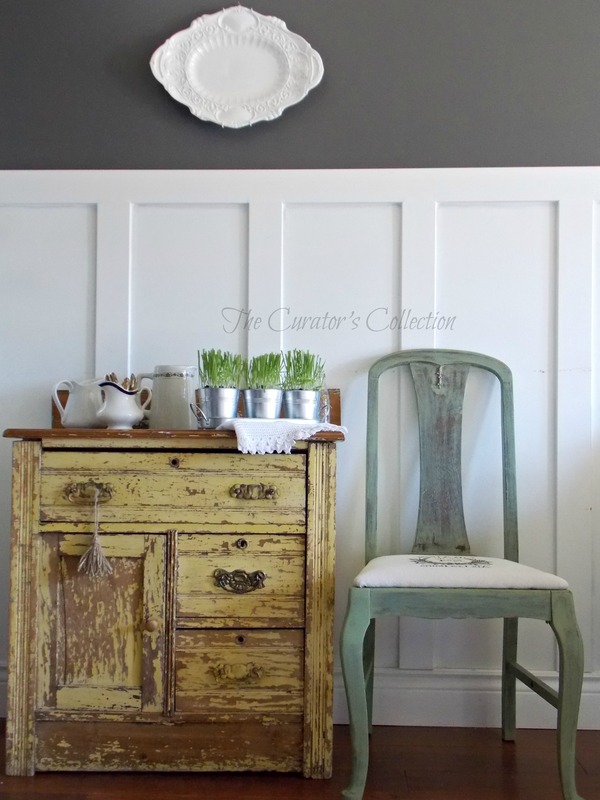 Outside of fixing the wobbly legs and back, this was a refreshingly simple makeover. I have been trying to use more color in my projects lately and I have to say I’d forgotten how much I like this green. I used clear wax to seal the paint but I bet it would look nice with a little dark wax in a few places as well. I had planted some Cat Grass a couple of weeks ago and having the brown thumb that I do, it only made it to the third cut before I somehow killed it :( This is one of the last times I saw it healthy. Not sure exactly where things went bad …. but I will try again! I hope you are having a great week so far! I would like to invite you to join me here tomorrow for Making Broken Beautiful. Check out last week’s party here. Thank you Nikki! That cabinet really does steal the show doesn’t it? It’s one of my most favorite pieces! 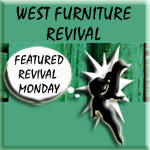 Even Miss Mustard Seed featured it on her site back when she had Furniture Friday. I think it’s a keeper! I hope you have an amazing day! Very nice Terry! I could just see your kids moaning at the thought of possibly being seen by someone they know as Mom picks up trash from the side of the road. LOL When my kids were young they did the same thing. The French graphic is perfect on the fabric – did you transfer it with TAP paper? Thank you Marie! That is the exact reason they never want me to stop with them in the car ;) Everyone ducks out of sight and covers their heads … ha ha. I don’t know what TAP paper is but this is transfer paper from Walmart that just irons on. I actually tried to do the wax paper transfer first not realizing it was a terrible idea to try and run it through a laser printer. 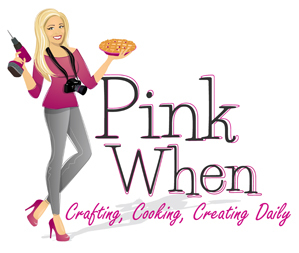 I completely ruined the printer as the wax paper melted to the inside …. I really never considered the heat of the laser printer melting it. On the up side …got a new printer! :) I hope you have an amazing day! 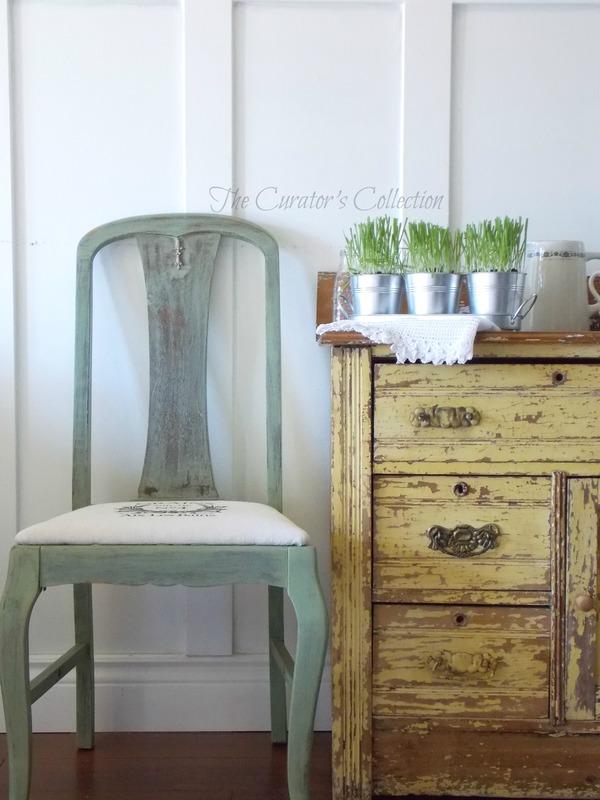 I love the color you chose for this little chair and the upholstery is just lovely. 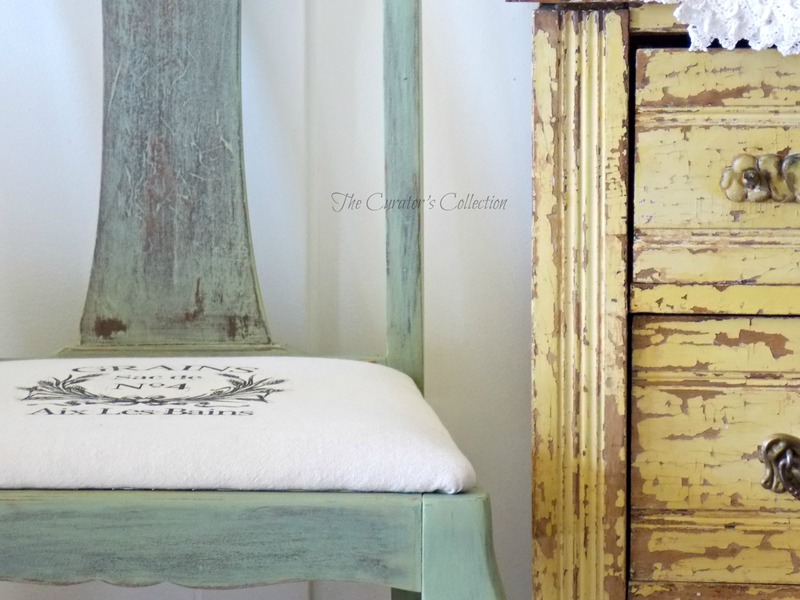 I have two old rockers that I refinished with stain that I’ve been dabbling with the idea of painting them something quite like this! Oh wow! I think a rocker would look adorable in this color, especially if you let the stain show through here and there! I’d love to see them when you are done :) Happy painting! I hope you have a great day! Thank you So much for the sweet comment Janet! I hope you have a great week! Great job. Love the fabric! Thank you Patricia! I hope you have a great day! Thank you for popping by! What a sweet chair. The color is lovely and I really like the upholstery. Thank you so much debra for the sweet compliment! I hope you are having a great week! This is beautiful, Terry! Love the pretty color. Thank you Amy! I hope you have a great week! Hello Madeline! I used an image transfer paper. Thank you for the lovely compliment! I hope you have a great day!